How does curly hair form a triangle? Advanced training in the art, method, technique & business of wavy/curly hair. When you shampoo a triangle it can get huge - and then the client wants 'help' with this 'form' that you (a hairstylist) has created and the only thing you know to do to 'fix' this triangle is to sell a flat iron to enhance the layering so that the hair lays flatter and to recommend products with 'shine' and 'frizz fighing' ingredients. These ingredients are melting into the hair when heat is applied and the client returns with broken hair, thinning hair or the ends are frayed and split. The hair has gotten worse over time in most cases. If you are told to 'thin' out their hair to reduce the puffyness - and you use thinning or chunking scissors on them - oh my....this can create shorter hairs that PUSH out the longer hairs to create a base that ADDS to the width of a triangle. Please put your thinning and chunking scissors away for using on curly hair - its a big no-no for curls. Many clients are asking for something different and the other option is to grow out their hair - to have no 'layers' and keep the hair at 'one length' so that the weight of the hair prevents the hair from flairing out and hopefully reduce the puff. As a hairstylist - I want to create technical perfection, straight lines and geometric shapes. This is what is taught at most industry trade shows and it really is an art form that I have much respect and appreciation for. Its difficult to do this with curly hair - possible yes, but we still have to deal with dry, unmanagable fly-a-ways (called "Halo") and puffiness that seems to frustrate our clients with the best and most expensive products on our shelves. I just had to learn to put these methods of Technical Perfection on hold for a bit while learning to work with curly hair. The main desire for clients with wavy/curly hair is just to have nice hair that is not dry & frizzy and they ask for showing them a predictible & managable hair care routine (without heat tools) so they can wear it in its natural state. Once you learn how to cut curly hair so that it's not 'technically perfect" you will have a head of hair that will grow out nice and they can go for 4 months in a lot of cases - and this is normal for a client to come in 2-3 times a year....some will come in 4 times or some with coils may come in once/year (maybe at 7-8 months). There is no reason to make a client feel guilty over not coming in every 6 weeks like a client with straight hair does to maintain their geometric shape. Curly Hair Artistry has formed a team of stylists with each one having a unique method and experience of working with wavy, curly and hair with coils. We are non-brand based which means we can use products that each stylist uses and gets the best results with and from this we can learn about what works best from a non-biased perspective. Product selection is uniqe and its own form of Artistry and is just as important as our cutting. We help you form a Personal Vision of how to incorporate this business into your Salon Vision. Working with curly hair truly is an art form. You can learn about the basics, expand your craft to form your own Artistry and make an impact in your community and we have a passion for helping you achieve this. If you are a hairstylist interesting in expanding your craft to learn about the Art, Methods/Techniques & Business of working with all forms of curly hair - click here. 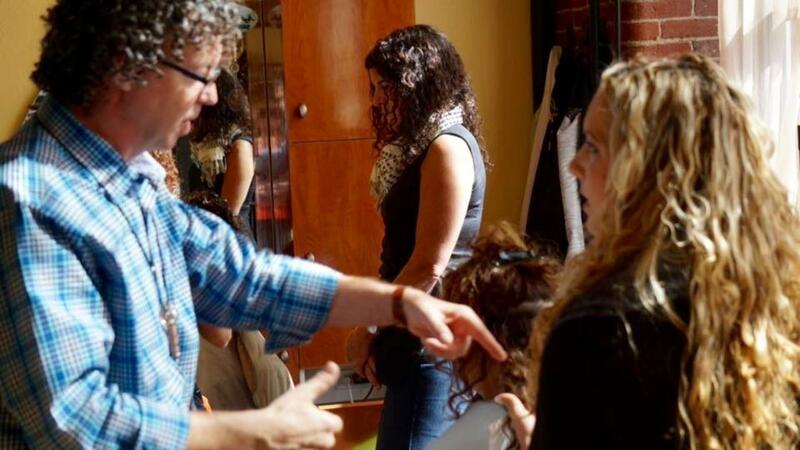 Curly Hair Artistry members work with all types of hair - our focus and live training events help you to infuse these business strategies to helping those with curly hair to embrace their hair (not to fix it) and create a new steam of business for you and your salon. We are excited to meet you at a future event or online through our social media platforms.